It’s unlikely one will ever find a reissue of “Tales of Topographic Oceans” in the record bins at Urban Outfitters or see hipsters sporting Emerson, Lake and Palmer shirts with their skinny jeans. But on Sunday night at the Uptown Theater, indie singer/songwriter Sufjan Stevens delivered a chunk of progressive rock that would have made fans of Gentle Giant and Yes proud. The earthy folk rock of Stevens’ breakthrough albums – “Seven Swans,” “Michigan” and “Illinois” – has been replaced by electronic, adventurous rock landscapes. About an hour into his two-hour set, Stevens explained the shift saying songwriting was “no longer loyal” to him so he started playing with rudimentary sounds. Extended segments of noises and effects – particularly on the 25-minute journey “Impossible Soul” – made the set feel more like an art installation that a rock show at times. But whether channeling Genesis and the Flaming Lips or Paul Simon and Cat Stevens, the Uptown’s sold-out crowd hung on every note. After tossing fans a bone with “Seven Swans,” Stevens and his 11-piece band focused exclusively on material from August’s hour-long “All Delighted People” EP and “The Age of Adz,” an album released this month. The poppy “Too Much” came with a boozy twin-trombone solo and could have been a dance hit in another dimension if not for the extended burps and warbles of guitars, organ and synthesizers in its second half. As the band delivered its complex themes and arrangements, a large trapezoidal video screen reinforced the themes. Space opera “The Age of Adz” featured a film that looked like an animated Funkadelic album cover. Stevens later explained the number as an “explorative supernatural song about love and heartache” and added that a “broken heart doesn’t always bring the apocalypse, but it always feels like it.”Sure it’s pretentious, but it was also a lot of fun and more accessible than it sounds. Several numbers were delivered with spare arrangements featuring little more than Steven’s voice and finger-picked guitar. “Heirloom” was just as delicate as its title, while “Futile Devices” was a soul-baring tribute to Stevens’ brother. When Stevens later forgot the lyrics during the quiet “Enchanting Ghost” it only enhanced the intimacy. Stevens prepped his crowd for “Impossible Soul,” informing them they were about to embark on an “intense, emotional, psychotherapy experiment.” The result was nowhere near as ponderous the introduction or running time implied. “Soul” is less a song than an exploration of a song idea from every conceivable angle. Melodies and themes were tackled via prog-rock, ‘80s dance and autotune before concluding with Stevens gingerly plucking his acoustic guitar. It was enough fun that the band slipped in a bit of Salt and Peppa’s “Push It” and one of the supporting singers danced around the stage spraying silly string. The crowd’s patience with the new material was rewarded with three songs from “Illinois.” “Chicago” ended the main set and drew the biggest cheers of the night. After saying goodnight, Stevens returned alone and delivered “Concerning the UFO” on piano and “John Wayne Gacy, Jr.” on acoustic guitar. It was a bit creepy to hear the audience sing along with Steven’s haunting portrait of the serial killer and an odd note to end the show on. As with the rest of the evening’s detours, no one seemed to mind. After five long years, the hero had finally returned to his fans. The path may not have been expected, but the results were just as spectacular.DM Stith: The opening act only got 20 minutes, but he had no trouble silencing the crowd. Armed only with his acoustic guitar, the singer/songwriter delivered four songs very much in mold of Stevens’ most popular work. Using several pedals and a sampler, Stith was able to recreate a percussion section and choir by building then looping a series of claps, stomps and harmony vocals. The trick may not be new, but it was still impressive. Stith’s songwriting was even better. It would be interesting to see what he could do with a full set. Several of his songs may be downloaded for free on the Website for Asthmatic Kitty, the label Stevens founded. Sufjan Stevens Setlist: Seven Swans; Too Much; Age of Adz; Heirloom; I Walked; Futile Devices; Vesuvius; Now That I’m Older; Get Real, Get Right; Enchanting Ghost; Impossible Soul; Chicago. Encore: Concerning the UFO Sighting Near Highland, Illinois; John Wayne Gacy, Jr.
David Gray rewarded a decade’s worth of patience Wednesday night at a sold-out Uptown Theater. 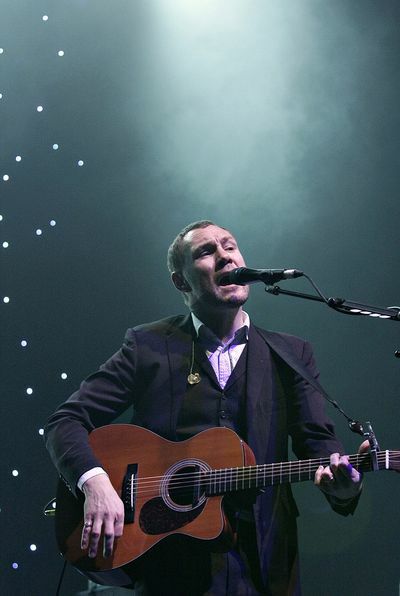 The English singer-songwriter broke through in America with the release of his album “White Ladder” in 2000. 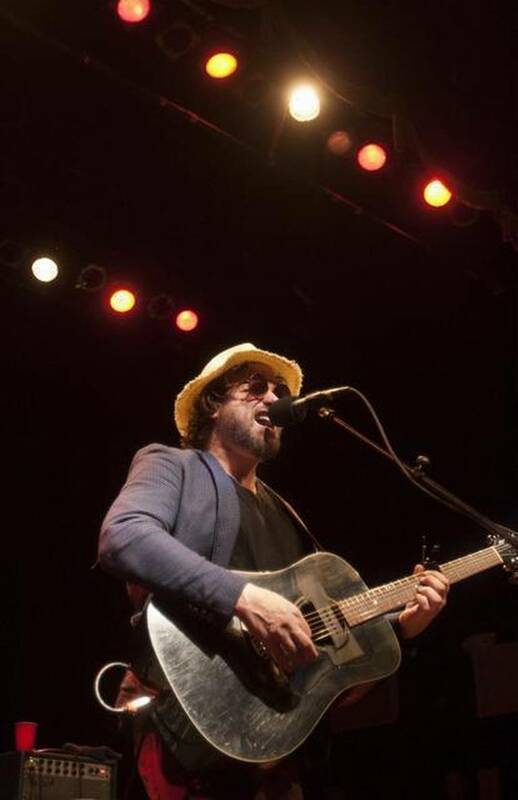 Gray has released three additional albums since then, but this was his first performance in Kansas City. The crowd didn’t need a reason to get excited, but Gray gave them incentive anyway, pulling out heavy hitter “Sail Away” early. Directing the audience into the chorus with a broad sweep of his arm, the performance felt like an encore. It was the second number of the night. Once he held the crowd, Gray never let them go. Or rather, the crowd never let go of him. Even quiet numbers were assaulted with proclamations of love and song requests. The opening chords of “Babylon,” the song that likely introduced a lot of the audience to Gray, drew an evangelic fervor. Arms were waved and voices raised as the congregation celebrated every syllable of the song. A couple times early on, Gray shook his head and wiped his face as if to shut out the relentless adoration, but the performances were too strong to be capsized by the overzealous assembly. Much of the credit for this goes to Gray’s four-piece backing band. All of the members save one were lined up on the lip of the stage, adding further intimacy to the evening. Positioned at extreme stage left, drummer Keith Prior was the secret weapon, adding urgency and energy in all the right places, yet knowing exactly when to back off. On “Now and Always” bass player Robbie Malone added a great bass line to Gray’s wailing harmonica that left the song sounding like a train in the distance. Guitarist Neill MacColl contributed great slide guitar to “Be Mine” and “Fugitive.” He also delivered especially nimble line on “Nemesis.” Behind them all, keyboard player James Hallaway was the subtle glue that held everything together. Shifting from guitar to piano, Gray was spectacular regardless of the setting, be it the spare, solo piano of “Ain’t No Love,” the hushed acoustic guitar of “Kathleen,” or an epic full-band performance like “Freedom.” Whatever he played and however he delivered them, Gray’s songs all bore a certain similarity. Many of them started at a glacier’s pace. Like an iceberg, they didn’t appear to be moving, then would suddenly tower over everything, overwhelming the surroundings with their strength and beauty. With touch of echo on the vocals and a starry backdrop, “The Other Side” seemed to be emanating from the Flint Hills. It was one of the more powerful performances of the night, but “Nemesis,” the next number, was even better. As thin beams of light bounced off a mirror ball and sprayed into the space, Gray closed his eyes and threw his arms out over his guitar as if healing the room. Meanwhile, everyone prayed it wouldn’t be another ten years until his return. Phosphorescent: This pleasant, low-key act from New York was the perfect complement to Gray’s asthetic. The quintet’s 30-minute set caught fire with a pair of Willie Nelson covers: “It’s Not Supposed to Be That Way” and “Reasons to Quit.” Unfortunately, just when they started to build momentum, time elapsed. They would definitely be worth a closer look in a smaller venue, like Davy’s Uptown. Draw the Line; Sail Away; Jackdaw; World To Me; Now and Always; Kathleen; Babylon; Be Mine; Stella the Artist; Slow Motion; Freedom; Ain’t No Love; Fugitive; The One I Love. Encore: This Year’s Love; The Other Side; Nemesis; Please Forgive Me. It didn’t take much for Flogging Molly to transform Fat Tuesday into St. Patrick’s Day. The Celtic punk band performed a blazing 90-min. set for a sold-out Uptown Theater crowd Tuesday night. The evening opened at full throttle with “Man With No Country,” a joyous jangle of guitars, violin, banjo and drums. “The Likes of You Again” started acoustically before exploding into a high-octane jig and reel. It’s a trick Flogging Molly has perfected: take an Irish melody, crank the performance to 11 and drop in an anthemic chorus. Although this leaves the songs sounding similar, there’s enough twiddling with the dynamics that they never get old. The banjo intro to “Drunken Lullabies” had everyone stomping so hard the balcony was shaking. When the full band finally entered, the crowd ignited in a fury of singing, clapping, dancing and moshing. It was the band’s biggest response of the night, although they came close a couple other times. After “Lullabies” it was impossible to go any higher, so the band dialed it down with a three-song acoustic set. “The Son Never Shines (On Closed Doors)” was dedicated to singer Dave King’s 87-year-old Irish mother. Dressed with a banjo melody and nifty slide guitar solo, the ode to a home that isn’t visited frequently enough was just as affecting as the full-bore material. The 90-minute set was split evenly between the band’s first two and most recent studio albums. Early in the set, King promised they would perform several more obscure songs, like “The Worst Day Since Yesteday,” but they didn’t seem to stump anyone signing along. With the house lights up, the crowd launched into the chorus of “Rebels of the Sacred Heart” after the opening chord. If that song felt like a soccer anthem, the next number, “If I Ever Leave This World Alive,” transformed the Uptown into an Irish pub. With cups hoisted and lyrics belted it was the second biggest response of the night. The Los Angeles-based Aggrolites set the bar high with their amazing 45-minute opening set. The quintet’s “dirty reggae” sounded like Kingston via Aztlan, or Los Lobos paying tribute to the Specials, sans horns. The band’s not-so-secret weapon was organist Roger Rivas, who propelled the most numbers with his mighty B3. Rarely pausing between songs, the band kept the energy high and the crowd moving. They closed with an optimistic, doubletime cover of the Beatles’ “Don’t Let Me Down” that found two members of Flogging Molly onstage contributing backing vocals onstage.